Birthplace : Hartford, Connecticut, U.S.
Eugene Francis Alan Pitney, known as Gene Pitney, was an American singer-songwriter, musician and sound engineer. Through the mid-1960s, he enjoyed success as a recording artist on both sides of the Atlantic and was among the group of early 1960s American acts who continued to enjoy hits after the British Invasion. In 2002, he was inducted into the Rock and Roll Hall of Fame. Gene Pitney set himself apart from the vacuous teen idols of the early 1960s with a series of smartly crafted, emotionally sung recordings that appealed to both young and old. More intense than contemporaries Paul Anka and Johnny Tillotson, Pitney's best recordings channeled the same type of romantic paranoia and desperation that typified the works of Del Shannon and Roy Orbison. During an era when the 45-rpm record was still king and preteens their biggest consumers, Pitney's vibrato-laden tenor transformed typical pop fare into dramatic yet catchy anthems of heartbreak and longing. Aided by some of the top producers, writers, and arrangers of his time, he scored a string of top-40 hits, some of which are considered timeless classics. Gene Francis Allan Pitney was born February 17, 1941, in Hartford, Connecticut, was raised in nearby Rockville, where he learned the basics of piano, drums, and guitar while digging the influences of such early rock and R&B pioneers as the Penguins, the Crows, Clyde McPhatter, the Drifters, and the Flamingos. By high school, the youngster was proficient enough to front his own local band, Gene & the Genials, and to record four sides--unreleased until 1990--with a local R&B group, the Embers. In 1959, when cute boy-girl duos were all the rage, Pitney and Ginny Arnell recorded "Classical Rock and Roll" and "Strollin' through the Park" as Jamie & Janie for Decca Records. This aversion to putting his given name on record continued when he waxed "Cradle of My Arms" and "Please Come Back" as Billy Bryan for Festival records that same year. According to his self-composed website biography, Pitney didn't make a stand for his own moniker until a record exec wanted to dub him Homer Muzzy. "Well, that was it. I wasn't going to go through life with a name like that! I decided it was time to use my real name...."
Although his early recorded efforts stiffed--they're highly sought collectibles today--Pitney began to achieve some notoriety as a songwriter in 1960. Multi-decade artist-producer-songwriter-session ace Al Kooper, who co-authored "I Must Be Seeing Things" for Pitney, recalled in the liner notes of 25 All-Time Greatest Hits, "[Publisher] Aaron Schroeder asked me to sit in on Gene's audition for him in the REALLY early Sixties. I advised Aaron to sign Gene as I was incredibly impressed by his talents ... and the rest is history." Schroeder--who co-wrote "I Got Stung," "A Big Hunk O' Love," and many others for Elvis Presley--began placing Pitney's songs with such notable recording artists as the Kalin Twins, Tommy Edwards, Steve Lawrence, and Roy Orbison. Eventually, the young songwriter would garner significant coin penning such major pop hits as "Rubber Ball" for Bobby Vee, "Hello Mary Lou" for Ricky Nelson, and "He's a Rebel" for the Crystals. Contractual complications compelled Pitney to use his mother's maiden name, Orlowski, on "Rubber Ball," the success of which convinced him to quit studying electronics at Connecticut University in favor of a full-time music career. Pitney made a bold step as a recording artist in his own right when a demo recording he cut for $30 interested Schroeder enough to release it on his new Musicor label. Although its chipper, almost girlish vocals encompassed more of Neil Sedaka's style than his own, Pitney's "I Wanna Love My Life Away" became a fringe top-40 hit. In the process the 1961 release established the nucleus of his style with its overdubbed back-up vocals, youthful tenor, and vibrato. As a favor, Schroeder asked Phil Spector to produce Pitney's follow up session. Spector, working without fee on one of his last freelance projects before starting the Philles label with Lester Sill, spent $13,000 on a session that normally would have cost $500. The commercial fortunes of "Every Breath I Take," featuring an uptown R&B approach reminiscent of the Drifters and an Orbisonesque falsetto ending, didn't justify its cost. Forty-one years later, Spector told Roger Caitlin of the Hartford Courant that the record bombed in America "because they knew what [Pitney] looked like. This nice Pat Boone kid with the bucks and the pompadour." However, Spector's blend of rock instruments with strings and kettledrums conjured a blueprint subsequent producers and arrangers, including Pitney himself, would follow very closely. The Schroeder-produced "Town without Pity" added swaggering brass to Spector's formula, transforming the theme to a strident, mediocre film of the same name into an Oscar-nominated hit. Another important association came via the writing team of Burt Bacharach and Hal David, who wrote such major chartmakers as "Walk on By," "I'll Never Fall in Love Again," and many others for Dionne Warwick. The duo crafted Pitney's western-flavored breakthrough hit "(The Man Who Shot) Liberty Valance." Intended for the John Ford-directed film of the same name, the tune never made it onto the soundtrack due to the movie's unexpected early release. A bemused Pitney told 25 All-Time Greatest Hits liner note writer Mike Ragogna, "We were in the studio about to record the song and Bacharach informed us that the film just came out." Bacharach and David composed the Pitney classics that helped him successfully cross over from his teen fans to adult contemporary audiences. The most enduring of these songs are "Only Love Can Break a Heart," "True Love Never Runs Smooth," and "Twenty Four Hours from Tulsa." Although Schroeder and Wally Gold are credited for producing these tracks, it was Bacharach who arranged and conducted the sessions, leaving his inimitable classy stamp on the finished product. Nineteen sixty-four was a tough year for most American pop and rock performers. British Invasion acts such as the Beatles, the Dave Clark Five, Herman's Hermits, Gerry & the Pacemakers, and the Rolling Stones were bumping the early 1960s teen idols off the airwaves, relegating them to oldies tours or premature retirement. 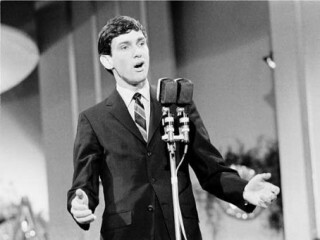 By contrast, Pitney's career initially flourished with two major hits, the Spector-influenced "It Hurts to Be in Love" and the Barry Mann/Cynthia Weil-penned "I'm Gonna Be Strong." Surprisingly, most of Pitney's subsequent recordings scored higher on the British charts than at home. In the process, he earned the respect of the Rolling Stones' Keith Richards and Mick Jagger, who wrote "That Girl Belongs to Yesterday" for Pitney to record, making him the first American to record a Stones composition. The disparity between Pitney's domestic and overseas popularity was dramatically evidenced by such chart-makers as "I Must Be Seeing Things," "Looking through the Eyes of Love," "Princess in Rags," and "Backstage," all of which hit the top ten in Britain but never got higher than number 25 on the American charts. Moreover, British audiences appreciated such early Randy Newman-penned gems as "Nobody Needs Your Love" and "Just One Smile," even after Americans turned a deaf ear to them. During the mid-1960s, Pitney attempted to expand his appeal by recording with country music icon and fellow Musicor artist George Jones. Pitney told Bill Kennedy of the Belfast News Letter, "I love the way George Jones drawls on things and the minute we started to sing then, it was as though I'd been a country singer all my life. I could phrase like George without even thinking about it--it was the natural thing to do. The high sound that I have and that beautiful low baritone of his worked very well together." Billed as George & Gene, the duo scored two respectable country hits, a remake of Faron Young's "I've Got Five Dollars and It's Saturday Night" and a rousing rendition of Doug Kershaw's "Louisiana Man." Pitney also recorded a handful of singles with Jones's frequent duet partner Melba Montgomery, the most successful being "Baby Ain't That Fine." However, still successful as a pop artist, Pitney saw no reason to continue pursuing a career in the lighter-selling country music field. Even though his last major American pop hit, the uncharacteristic R&B chanter "She's a Heartbreaker," didn't make the charts overseas, Pitney continued to rack up top-40 hits in England through the early 1970s. Concentrating on his overseas audiences, the singer took second place at the San Remo Song Festival in Italy twice and recorded the regionally popular "Nessuno Mi Puo' Giudicare." Although the worldwide hits eventually dried up, Pitney toured overseas constantly until he hurt his voice in the mid-1970s. From that point on he began concentrating more on his family and real estate ventures, leaving live performances scattered over six to eight months of each year. Domestically, Pitney's last shot at the big time came via three unsuccessful singles for Epic in 1977. Yet good fortune smiled on him in the ensuing decades. A lengthy court battle with Gusto Records over unpaid royalties on reissue packages of his old Musicor hits resulted in a federal judge awarding him $187,762. In Britain, where he remains a star to this day, Pitney rerecorded "Something's Gotten Hold of My Heart" with former Soft Cell lead singer Marc Almond in 1990. The result was his very first number-one record in the United Kingdom. Finally, in 2002, the former teen idol oft hailed as "one of pop's great sufferers" was finally accorded some overdue recognition in America when he was inducted into the Rock and Roll Hall of Fame. Pitney died on April 5, 2006, aged 65. His tour manager found him dead in the Hilton Hotel, in Cardiff, Wales, in the middle of a UK tour. View the full website biography of Gene Pitney.